Date of Hike: Saturday, January 26th, 2019. Trail Conditions: Unbroken snow, drifted powder. Comments: Wide variety of conditions on this hike, as one would expect in Winter on the Rocky Branch Trail. Our group consistently navigated a mix of hard-packed snow, unbroken snow, and heavily drifted unbroken snow from start to finish, slowing the pace considerably in some sections. The Engine Hill Bushwhack was completely drifted in when we arrived at the “T” intersection that marks the turn-off, so we did our best to lay down a legitimate set of tracks. Our route wasn’t perfect, but it did avoid the worst of the river crossings. Although we did run into 4 other people headed for the summit on our way back down, all on snowshoes, Rocky Branch Trail and the Engine Hill Bushwhack are now both buried under 10-12” of snow after last night’s storm. Anyone heading out should expect to break trail, especially before the weekend. 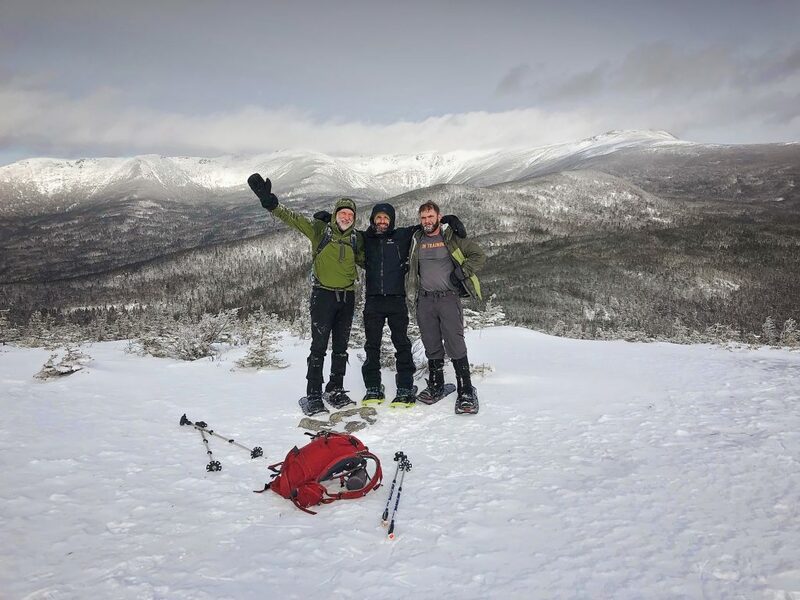 John Pike, Jimmy Nolet, and Alex Thibedeau find success on the summit of Isolation.